A German auction house that hopes to rap the gavel on an antique Apple-1 personal computer in May has pegged its likely sales price at between $190,000 and $320,000. 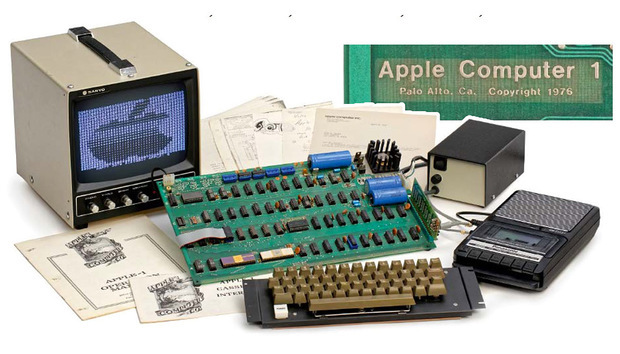 The Apple-1, one of a handful verified to work, will be put on the block May 20 by Auction Team Breker of Cologne, Germany. The first pre-assembled personal computer, the Apple-1 lacked such amenities as a power supply, keyboard or display. Those were supplied by the computer hobbyists who bought the boards direct from the embryonic Apple or from the Byte Shop, an early computer store in Mountain View, Calif. In 1976, the first Apple-1 personal computers were sold for $666.66, or approximately $2,830 in today's dollars. They remain rare, with about 60 of the original 200 known to exist, several in the hands of museums such as the Smithsonian Museum of Art in Washington, D.C., and the Henry Ford Museum of Innovation in Dearborn, Mich.
Breker's estimate was lower than recent sales prices of other Apple-1 computers. Interest in the machine has surged since 2010 as Apple itself blew through one revenue record after another, and as co-founder Steve Jobs died in 2011, marking to some the passing of an era in personal computing. Auction prices jumped from $242,000 in 2010 to $671,000 in 2013, then topped out at the $905,000 paid by The Henry Ford Museum in October 2014. The lower projection by Breker may be because the auction house believed interest has waned or perhaps because of minor modifications to the circuit board. Mike Willegal, an engineer with a major technology company whose hobbies include tracking Apple-1 computers, noted that the system had an extra capacitor and additional logic on the board. Breker's Apple-1 is in working order, the auctioneer asserted, and backed up the claim with video of the computer loading several short demonstration programs from a cassette and running them. It has had but one owner, whom Breker identified only as a Berkeley, Calif., computer engineer. The computer will be accompanied by some paper documentation -- not unheard of in sales of technology antiques -- that includes the receipt for the original Nov. 30, 1976, purchase, a letter from Apple's customer service department dated from 1979, and a record of phone conversations with company founders Steve Jobs and Steve Wozniak.